WASHINGTON, Nov 6 (Reuters) - From a suspected Israeli airstrike in Sudan to cyber warfare in the Gulf and a drone shot down over Israel, the largely hidden war between Iran and its foes seems heating up and spreading. Despite months of speculation, most experts and governments believe the risk of a direct Israeli strike on Tehran's nuclear program stirring regional conflict has eased, at least for now. But all sides, it seems, are finding other ways to fight. For the US and European powers , the main focus remains on oil export sanctions that are inflicting ever more damage on Iran's economy. But the Obama administration and Israel have also ploughed resources into covert operations - a campaign that now appears to have prompted an increasingly sophisticated Iranian reaction. With Iranian hackers suspected of severely damaging Saudi oil facility computers and a suspected Hezbollah drone shot down over Israel, tactics and tools once seen as the sole purview of the United States are now clearly being used on both sides. The mounting body count in Syria, some believe, is also in part a consequence of the proxy war being waged there. "In many ways, it's reminiscent of the Cold War, particularly the proxy conflicts," says Hayat Alvi, lecturer in Middle Eastern politics at the US Naval War College. "But unlike in the Cold War, there are now a much larger number of asymmetrical warfare techniques. Most of this is happening behind the scenes, but in the modern world we are finding it difficult to keep them secret for that long." Covert confrontation itself is, of course, nothing new. Foreign intelligence agencies have battled for decades to stop Iran and other states obtaining nuclear material, while Tehran and Israel have long needled each other and proxy battlegrounds, particularly in Lebanon and the Palestinian territories. The U.S. and Israel are widely suspected of using the Stuxnet computer worm to target Iranian nuclear centrifuges. Meanwhile, most experts believe Israel's Mossad was involved in assassinations of several nuclear scientists - attacks suspected to have prompted similar bomb attacks on Israeli diplomats in India, Georgia and Thailand and tourists in Bulgaria. But it does seem to be escalating. What Tehran is trying to do now, most analysts believe, is in part further retaliation. But its rulers may also be indicating that the Islamic Republic now has a range of new and potentially damaging options in reserve should its nuclear facilities be bombed. The penetration of Israeli airspace by an unmanned drone apparently operated by Lebanese militant group Hezbollah - a long-term Iranian ally - was, perhaps, one of the clearest examples so far. The drone was shot down by Israel's military in the vicinity of its main nuclear facility at Dimona. Iran has long been believed to be putting resources into a drone programme and may have gathered useful tips after a classified U.S. Sentinal stealth drone came down in the country last year. While the Hezbollah drone was unarmed, a attack with multiple drones laden with explosives might prove harder to stop. The dramatic spike in suspected Iranian cyber attacks this year also has some in the U.S. distinctly worried. While direct denial of service attacks on U.S. banks - widely seen as retaliation for US sanctions and attempts to freeze Iran from the international financial system - were seen relatively simplistic, attacks on US allies in the Gulf were more complex. The most worrying, experts say, were those on Saudi oil firm Aramco and Qatari gas export facilities. Last month, US Defence Secretary Leon Panetta described the Saudi attack as the most sophisticated yet launched on a private company, effectively destroying tens of thousands of computers - although he stopped short of blaming Tehran directly. 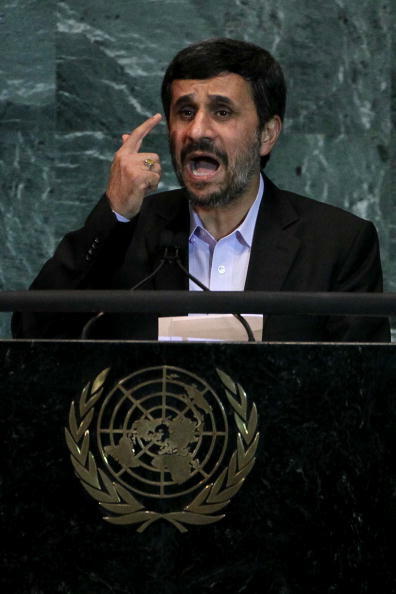 Iranian officials have tended to deny involvement. But they say they have continued to come under cyber attack themselves with systems at Iran's own oil facilities, communications and infrastructure firms suffering problems last month. "The problem is that these are secret forms of warfare that are rarely, if ever, discussed publicly," a veteran former CIA official and now a senior fellow at the Brookings Institute told an event last month. "And yet the implications could be colossal. What do we do, for example, if it turns out the Iranians can shut down the entire Saudi oil production." In the absence of direct face-to-face negotiations, such actions can also be a diplomatic tool in their own right. "The cyber attacks and Hezbollah drone both represent an escalation from the Iranian camp," says Ariel Ratner, a former Obama administration political appointees at the State Department and now fellow for the Truman National Security Foundation. "But a lot of what is going on here is a matter of signalling to each other." That might also in part explain a suspected Israeli airstrike on the outskirts of the Sudanese capital Khartoum on October 23 that caused a major fire at Sudan's Yarmouk arms factory. "Israel is flexing its muscles militarily and also sending a message to Tehran and Washington that it will not hesitate to use force to defend itself," says Bilal Saab, director of the Institute for near East and Gulf Military Analysis based in the United Arab Emirates and Washington DC. "It was a show of force meant to send political messages and achieve precise and immediate military objectives, those being the prevention of Iranian shipment of sensitive hardware to its proxies." Israel refused to comment after Sudanese officials said four of its aircraft conducted the attack. U.S. officials would not comment on what they believed happened, but spy agencies have long suspected Iran of smuggling weaponry into Eritrea and Sudan and across Egypt to Hamas militants in Gaza. Last week's four-day visit to Sudan by two Iranian warships - coming mere days after the arms factory attack - appeared an unusually public show of solidarity between two nations. Some suspect Israel is also raising its support for South Sudan, which gained its independence last year and has since teetered on the brink of conflict with Khartoum. The much more significant proxy confrontations, however, remain in the region itself. Israel is taking something of a back foot in the conflict in Syria - its officials saying any support they might give for anti-Assad rebels would be counter-productive - but Iran's Arab rivals are not. For Washington, rolling back Tehran's influence in Syria is seen as a distinctly secondary goal to stopping - or at least limiting - the bloodshed. For Saudi Arabia and Qatar, however, arming the rebels, the prospect of replacing the Shi'ite Alawite rule of Bashar al-Assad with a Sunni majority government with no Iranian links is seen as a key motivation. The war there is already seen destabilising neighbouring Lebanon, while the body count in Iraq has also been creeping back up as violence between Sunni groups and sometimes Tehran-backed Shi'ites simmers. The Sunni leadership of almost all of the Gulf states have long suspected Iran of stirring up dissent amongst their Shi'ite populations, although Western diplomats suspect such claims are overstated. Some worry Washington is already being dragged onto one side in a growing regional blood feud. Tehran may step up its attempts to destabilise neighbours, particularly if it believes its enemies are trying to do the same. Washington recently removed Iranian militant opposition group MEK from its list of terrorist groups, potentially opening the door to covert co-operation. To work with it on attacks within the country, however, might produce a violent response. Last year, U.S. officials said they had foiled an Iranian plot to kill the Saudi ambassador to Washington by bombing a restaurant in Washington DC. That, some security experts said, suggested Iran was increasingly willing to take serious risks - although others said the entire tale sounded too far-fetched.